Got my 1st Payment from Google AdSense!! To be honest, I'm really surprised. Just 20 days ago, I shared a success story - 2nd Payment from 360 Ads! In that post I mentioned, due to the transaction issue, my AdSense Payment is not coming to bank account. But only a few days ago, I got my Payout from Google AdSense! 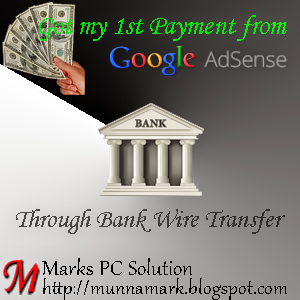 Only a few months ago, Google introduced Bank Wire Transfer for Bangladeshis. And I selected this payment system immediately. Then Google sent $272 to my Bank Account. But the payment was rejected by Citi Bank NA Singapore due to compliance issue. And I got disappointed. Then I've contacted AdSense team. They assured that, the problem will be solved soon. Days were passing but I found no luck. Again they sent payment of $438 on 21 February, 2014. And I was continuously checking my bank account. Few days later, AdSense Compliance Team informed me that they need some additional information to verify my account. I've provided the necessary information. If everything is okay, I will not suffer to collect my next payment. Since AdSense has resolved the compliance issue and verified my account. Payment was made through Bank Wire Transfer. And the service charge is really low. Google doesn't take any fee over the transfer. My CPU is about to die - shuts down any time without notice! Sometimes it runs 3 days without problems. Sometimes it doesn't run for 3 minutes properly! And the most recent problem is Hard Disk Error. Windows 8 has detected a hard disk error. It warns to back up my files. I may lose all of data any time. So I've decided to purchase a new system. My budget is $ 350. After purchasing the PC, hopefully I will discuss about PC configuration, hardware etc. And as I'm earning continuously, my parents hardly get borded with my PC works. :) Now I've got more opportunites to enrich my site. And the visitors of Marks PC Solution will get more . . . I enjoy fixing the laptops of others. But I don't like to carry my own laptop to the service center! Well, to be honest, I'm impressed of what you earned through Google Adsense. Can you send me your post on how to Adsense? To tell you frankly, I have no idea on how to do this and to get started. First you need to apply for AdSense ads. If your site is accepted, you will get Ads. Read more: Guidelines before and after Getting AdSense! Convert PPTX to PPT Online! Convert Image into Icon Online! Shut Down, Restart, Sleep & Hibernate Shortcuts!! Got my 2nd Payment from 360 Adds!